As a 22 year old, it is always humbling to have to ask for money from those whom I know, in many cases, are struggling financially themselves. There seems to be a financial need everywhere these days - coming to us from places like our homes, workplaces and places of worship. It is sobering to call to mind the fact that everything we have is thanks completely to the generosity of the many viewers and listeners who continually sustain our work. And yet, at the same time, the entire office and I are filled with a profound conviction that what we are doing is critical for a Church that we believe is alive and young. Without Salt + Light Television, where else could people go to find the unique types of stories and documentaries that we have been able to produce these past 10 years? Salt and Light's goal over the past decade has been to teach and evangelize, inform, encourage and help build up the Catholic community. We have done this quite effectively by offering information and resources to priests, pastoral ministers and Catholic faithful across Canada. "The Bishops of Canada are most appreciative of the balanced information and faith-inspired insights that Salt + Light provides. 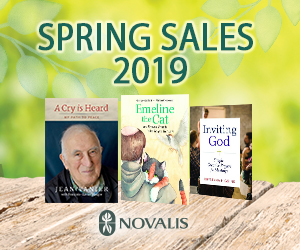 Your catechetical programs, especially your multi-lingual documentaries on the new Saints and Blesseds, make a significant contribution to the Church, helping form a new generation of the faithful while also keeping older generations inspired and rejuvenated. We pray that God strengthen you and all involved with the Foundation as by your ministry you help keep the Church itself "alive and young!" "For over ten years now, Salt and Light has been engaged in a key area of evangelization, using modern media to communicate the Gospel. The team at Salt and Light is much to be commended for their dedicated to the mission of evangelization, and for their creative and technical expertise which is clearly evident in the excellent work which they have produced over the past decade." So how can you help our campaign? In 2011, we issued a plea for monthly donations through our Guardians program. This proved to be an incredible task for us. Today, we are asking you to consider becoming a Guardian of Salt + Light at the parish level. As a special gift for signing up, we will send you a copy of In Your Faith, Season 2, a very practical teaching tool for your RCIA and youth ministry programs. We have developed a new poster that explains, in simple words and visuals, our ministry. We would be grateful if you could hang this poster in a high traffic area in your parish. We hope that our posters will not become just another piece of mail in your junk pile. Our ministry includes six media platforms from TV to radio and is accessible to all through our website, saltandlighttv.org. From there, Catholics -- and those interested in the faith -- can review more than 4800 videos, learn about the saints, download podcasts, live-stream content and read more than 2100 blog articles written by passionate and formed Catholic youth. Eighty percent of our Canadian population has access to the internet. Christians today need to feel our Church's presence on the web, television and in other media channels. With your prayers, endorsement and financial contribution, we are confident that this campaign will continue to yield numerous blessings and a stronger faith community throughout Canada -- and in the thousands of parish communities. The momentous events of the past weeks in the Church remind us once again how important it is to have reliable sources of information about our Church. That is why during this special Year of Faith, we are embarking on this very important campaign, together with the celebrations of our 10th Anniversary.. All in all, we are hoping that we can count on new support and financial generosity from parishes all across the country. This will greatly help us in our mission to spread stories of inspiration and hope. Please consider making a donation to Salt + Light today. We are your Catholic Channel of Hope and we are depending on you, one parish and one Catholic at a time. Please call us today and help bring Salt + Light Television into another decade of media ministry. We just can't do it without you. Thank you.